A violet goby is a speckled trout favorite, and just might be the reason we have purple-colored lures. Keeping a close eye on what a trout throws up when you reel it in can give important clues on what it’s eating that day — and might ultimately help you catch more fish. We were fishing Delacroix, La., when a speckled trout coughed up this weird thing shown in the accompanying photo. 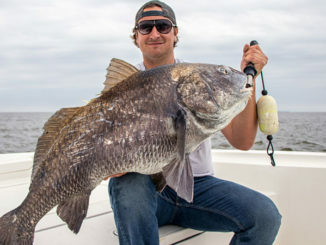 Read on to learn what exactly it is — and why it’s important to you as an inshore angler. It was another spring day of targeting trout off of Oak River in Delacroix, and the specks were doing what they always do — holding in deep water with current and flowing bait. Given this, the winning pattern was easy to discern: locate deep holes and fish bottom structure slack-lined, with a ⅜- to ½-ounce jighead. But the trout were also doing something else they always do: Sliming up anything they touched, pooping everywhere and barfing up their food. I swear they aim for upholstery and GPS screens. Given this, I have a habit of looking at what they throw up, because it could give me a clue to what they’re eating. Even when half-digested trout favorites like shrimp, pogies, and mullet are easy to identify. But a few trout that day coughed up something that we could not get an ID on. A quick glance might lead one to believe it’s a mullet, but the shape of the tail ruled that out. And the face? Nothing like a mullet’s. So, as a last resort, I took a picture and sent it to a marine biologist I know and trust to provide the correct answer …. And she did. What is a violet goby? Violet gobies are ugly, bottom-dwelling fish that feed on organic detritus, a fancy $10 word that means crap. But they could also be the reason why we have purple lures. 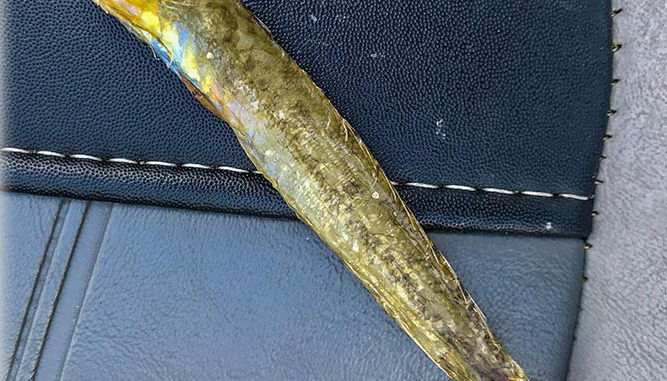 The only ones I’ve seen in the marsh where coughted up by trout but those seen in a cursory image search online reveal a fish with a near-exotic color. Look for yourself and see how radiantly purple this fish is: It sort of reminds me of a purple Sparkle Beetle. Take it a step further: The shape and size remind me of a queen-sized Sparkle Beetle. And these weirdo fish feed on the bottom, right where we catch speckled trout on a jig. This begs the question: Do trout bite purple on certain days because they best see that color in those water conditions? Or are they biting purple because that’s the color of the gobies they are feeding on? Of course, I’m making the assumption that violet gobies appear very purple in the wild. I don’t know, but maybe a shrimper could tell us. Either way, this is part of an inshore angler’s journey: The learning curve. When you learn, you ultimately catch more speckled trout and redfish — but the key is paying attention and knowing which questions to ask. So keep a close eye on what that trout just spewed all over the bottom of your boat — it might actually help you put more fish in the box.